LED FAQ – How can we help? Here you’ll find answers to frequently asked questions concerning plant breeding and LED. The list is updated on a regular basis. To learn more on a certain topic please klick on the questions. How do I find out which LED is right for my grow area? Easy – just use our LightGuide! (coming soon – you can use the German Light Guide instead) We’ll tell you more about illumination and depth effect in the next section. How good are illumination and depth effect with LED? To start with, COB LED set-ups are usually comprised of more than one light source. Next to providing the levels of light intensity needed for a certain area, the spreading of the light sources ensures more efficient illumination of the area. As a result the illumination is more even and effects more homogenous plant growth than conventional HPS lighting set-ups. Another advantage of using multiple light sources is the increase of covered angles of illumination which in turn leads to a significant increase of depth effect. What is the optimal distance between LEDs and the tip of the plant? We suggest a minimum distance of 30cm to prevent possible malformation of leaves, buds and progenies. Everything above 30cm is a question of personal experience. It should be noted, however, that the more distance you put between the light source and the plants, the less the levels of light intensity available to the plants (see: PPFD-value). PPFD-value - what does that mean? The PPFD value is used to measure the efficiency of grow lights. While lumen and LUX values are more widely known, PPFD values are much more conclusive concerning plant growth and how it is impacted by different light sources. Learn more: “grow lights – measuring values”. What is color-temperature and what should I make of it? Color-temperature is commonly known as ranging between warm white and cool white. While cool whites (5000K and higher) enhance vegetation and stocky plant growth, warm whites (below 3300K) further the plant’s fruiting and flowering phase and encourage tall growth. However, as our LEDs operate around 3500K neutral white, both phases are covered. As a result the plants are provided with optimal lighting conditions during all phases and will display healthy growth. Our COB LEDs offer large amounts of power. If the grow area is well illuminated and suitably powered, the plants can grow more stocky than usual. To counteract this we suggest increasing the distance between plants and lights. Note, however, that this will also decrease the level of light intensity. Light temperature can be divided into three categories: 2700K-3000K for fruiting and flowering, 3500K-4000K for all phases, 5700K-6000K for vegetation. Which types of plants can I light with LED? LED is suitable for every plant that needs sunlight. Since all our LEDs, whether DIY sets or plug and play units, can be dimmed, they can all be adjusted to the individual needs of each type of plant. Further, the light emitted by our full spectrum LEDs is very similar to sunlight. Get to know more about light: “Light in relation to plant growth“. Do I need the same amount of fertilizer or does the use of LED lighting change things? Experience has shown that providing ideal lighting conditions with LEDs can lead to increased growth. As a result the need for fertilizer application can rise up to 50%. Is a LED light more heavy than a HPS? Due to its more complex construction and the need for a cooling system, LED lights are usually more heavy than HPS lights. Our LEDs are passively cooled and need a massive heat sink. Depending on the unit, our lights can weigh between four and ten kilogram. Depending on the overall set-up it is possible to reach about 30 kilogram and consequently it is vital to make sure that the weight can be carried. What is the difference between passive and active cooling for LEDs? Active cooling systems utilize water or air cooling devices. While this can reduce weight and cost of the LED unit, active cooling systems introduce additional error potential through adding mechanical components like cooling fans and water pumps. A failed cooling system usually leads to sudden overheating of the unit and subsequent destruction of the LED. Opting for a passive cooling system calls for a massive heat sink. The advantage, however, is a completely silent, safe and maintenance-free cooling system which in turn guarantees a long service life. 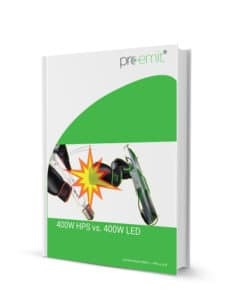 How much heat do LEDs produce in comparison to HPS lights? The heat produced is dependent on the energy needed to reach a certain level of light intensity. The advantage of LEDs over HPS is that LEDs need significantly less energy to produce comparable levels of light intensity. For example our 400w LEDs will achieve higher illumination values than a 600w HPS light. Find more information on comparing operating values on our blog. Here you’ll find the most frequent questions and answers about Far Red LEDs. To get to know more on a certain topic please click on the question. Do Far Reds need an extra driver or can I use the driver used for a DIY-M-KIT 200W? Far Red LEDs need an extra driver. It is available as a standalone-version or as part of the Addon KIT. The driver is available individually, its called: LPC-35-700. What illumination times are recommended? Do these times only apply to fruiting and flowering phase? We recommend using Far Reds to initiate sleep 5 minutes before turning off the main lights. Keeping them on for all in all 15 minutes, they will send the plants to sleep by providing the last light source for 10 minutes. We recommend using Far Reds only during fruiting and flowering phase. Which Far Red KIT is right for me and how many Far Red LEDs do I need to illuminate 1m²? Wether you prefer a ready made KIT or a DIY solution, we recommend using 8 sleep inducing Far Red LEDs to illuminate 1m². Our DIY-M-KIT Far Red standalone in combination with our matching DIY-M-KIT Far Red extension is a good solution. You can mount them individually or attach them to the DIY-M-KIT’s green brackets. Suitable for everyone they are an interesting add-on even for “non-led-users”. Can I use Far Reds for the waking phase? We have no supporting information on this. Far Red LEDs are said to complement the COB LEDs, how does it work? Since Far Red LEDs cover the spectrum between 720-740nm they complement the CREE CXB3590 chips excellently. See: spectrum coverage CXB3590 chips. Can I shorten the driver's cables if they are too long? Of course you can! Just make sure to do it properly and not to cut off too much of the cable. The included M4 screw is too large for the ring terminal / the ring is too small! The M4 screws are not meant for the ring terminal. They are used to mount the heatsink’s brackets on to the DIY-M-KIT’s brackets. The grounding cable takes a M3 screw and can be fastened to the driver or to the LEDs. No answer to your question? Contact us at support@pro-emit.de!